Cleopatra : Queen of Egypt is the latest in the Historical Notebooks series put out by Templar Press, an imprint of Candlewick Press, the great publishing house that brought us the wonderful Ologies series, which most often feature fantasy themes, but also cover topics like Pirates, Spies, Egypt, and the ocean, making them great companions to the Historical Notebooks. 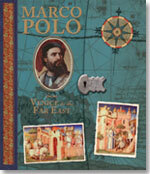 Other books in this series feature Marco Polo, Charles Darwin, Charles Dickens and Shakespeare. 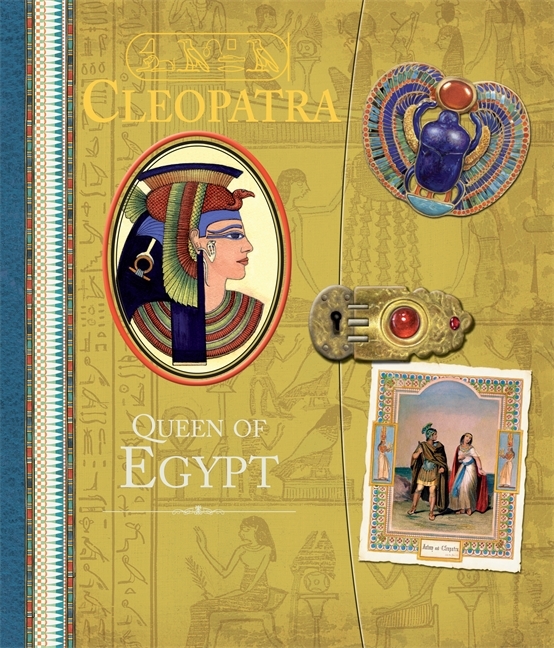 As with all the Historical Notebooks, Cleopatra : Queen of Egypt is interactive with flaps, maps, booklets and envelopes stuffed with letters. 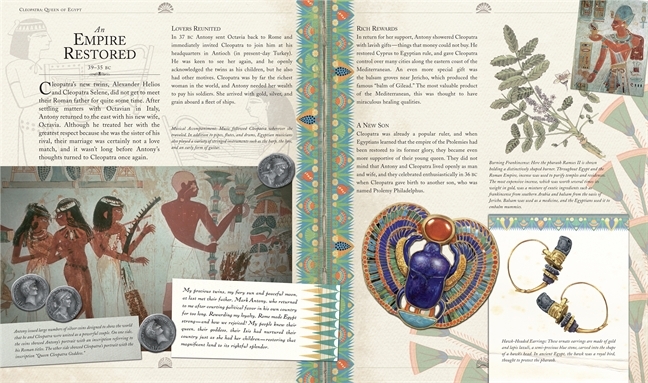 At the start of the book there is a publisher's note telling the reader that "history has handed down very few reliable glimpses of the real Cleopatra. No diary or memoir has ever been found, and only one solitary word on an ancient papyrus is thought to be in her own handwriting. To explore how she might have felt about the events of her life, this book includes fictional extracts from a memoir that Cleopatra may have started to write during the uncertain days preceding the battle of Actium. The truth, however, remains buried in the past." To me, this is as interesting a slip of information as anything that comes in the rest of the book and is not to be missed. The book begins, "Cleopatra is one of the most famous women in history. She lived her life in the headlines of her day - as queen of Egypt, the richest person in the world, and mother to the children of the Roman Empire's greatest leaders." Wow. Her life story begins with a look into her heritage and continues on into her royal childhood and her lessons on how to be queen, including a chart showing the different kinds of crowns worn by the pharaohs. The fall of the last pharaoh lead to the leadership of Egypt by the eighteen year old Cleopatra and her ten year old brother Ptolemy. A woman could not rule alone, so the siblings were wed so that they could rule as king and queen. Ptolemy became jealous and eventually forced Cleopatra to flee to a desert fortress near the border. The fascinating history that followed, taking place in Rome, Egypt and Alexandria and including Julie Caesar, Antony and a great war that includes the Battle at Actium, a great naval battle during which Cleopatra betrayed Antony, take up the rest of the book. 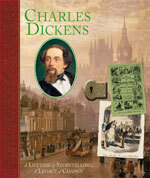 Her final days, mummification and legacy are covered in the last pages of this completely engrossing book. As someone who did not pay much attention in history class and does not have much time to catch up now, I adore the Historical Notebooks, preferring to take my history with a large dose of illustration. And I suspect most kids are the same. 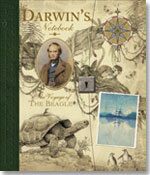 My son, before he could even read, sat down with Charles Darwin and the Beagle Adventure and "read" it cover to cover. 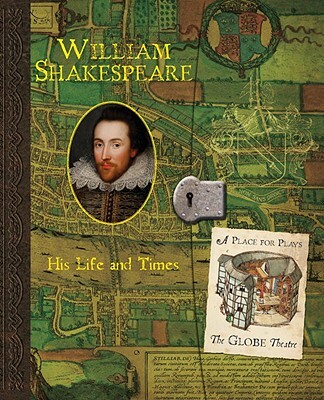 As a bookseller, these I often recommended this series of books for kids writing reports or homeschooling parents looking for a way to make their history lessons a bit more fun.